TRG Communities is excited to announce a brand new fitness center for community residents of O'Neal Village opening next week. The fitness center will be outfitted with state-of-the-art equipment, including treadmills, stationary bicycles, elliptical trainers, and numerous weight training machines. TRG Communities President, Jeff Randolph said, "Building communities for a neighborhood lifestyle that values personal health and wellness is at the core of our company, whether it's installing sidewalks on every street, creating recreational trails, or opening fitness centers. We are excited to add yet another great amenity to this growing neighborhood." 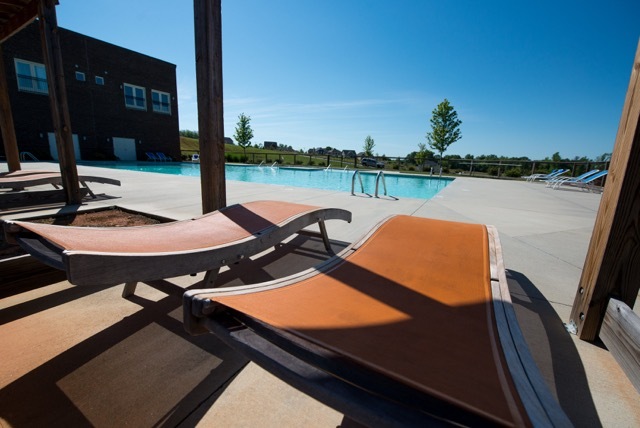 The new fitness center will overlook O'Neal Village's resort-style pool and lounge area. The fitness center is also adjacent to restrooms and changing areas for resident's convenience. The fitness center will be accessible through an elegant stone pathway located next to O'Neal Square. Be on the look out for pictures and updates of this great new amenity coming to O'Neal Village!